Lelouch is back in Code Geass: Hangyaku no Lelouch R2 to take revenge on his father and to change the world. After an exciting cliffhanger ending of the first series, how will it end? Code Geass: Hangyaku no Lelouch R2 is here to answer all your questions and provide the ultimate ending that will shock everyone. That was necessary. Since this is a direct sequel to the first series, many elements of the story are continuations from the first series. That said, I will be referring to some points taken from the first series in reviewing this series. Let's start of with the cliffhanger. Lelouch has been mind-wiped and dropped back into his 'normal' life as a high school kid. He is constantly monitored by undercover Britannian forces that will do everything to prevent him regaining his memories. Of course when you first watch you will have no idea what is going on. What happened to Lelouch after the end of the first series is adequately explained within the first few episodes of the series. This is after he regains him memories of the past. Basically, after the return of 'Zero' the whole 'I must take over the world' story gets into motion once again. So throughout the series you will be watching as 'Zero' and his rebellion try to overcome the Britannian Empire rule by any means possible. Any means possible meaning lying or betraying friends in the process. The whole story is basically one big plot twist where love and hate are always constantly being challenged. By the end, you will have totally lost count of how many times a character has switched sides. However, what comes in the end is just truly genius. Since I got used to the first series art style, this series didn't make that much of a difference to me. I must say that the battles have gotten more fierce and mechs more stronger and the explosions are stunning. Really well done for visual presentation and character appeal. I really didn't mind the squishy faces anymore, I must have gotten too used to them. Voice acting is pretty much the same as the first series. Lelouch's voice still slightly annoys me at times. Anyway, apart from him, the other characters were excellent. I found the theme songs in Code Geass: Hangyaku no Lelouch R2 were better than the first series. Also the sound effects were great with plenty of explosions and gunfire. Characters' motives and personalities are revealed even more in this series. 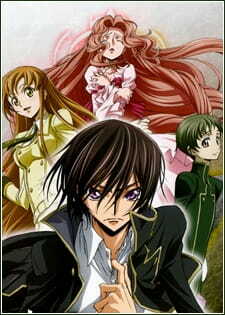 You will get to know Lelouch a lot more in this series as his identity is revealed to everyone. In the end, you will feel some pity for him. There are just so many characters shown throughout this anime there is no way to get to know them all. However, the main characters you will definitely find memorable are Lelouch, Kallen, C.C. and Suzaku. They are pretty much central to the whole plot of the anime. Overall, this series was really enjoyable to watch. Being able to finally see the end of this epic two-series story is just satisfying. Everything is explained and you will fully understand why Lelouch has his attitude and how he solved the problems of the world in one big plot. This anime is amazingly compiled and just makes sense in the end. Same as first series with little or no difference. I liked this series' theme songs better than the first. Characters are all the same. Mixture of many different characters. Amazed and impressed at the ending of the story. I enjoyed the anime a lot. Suitable for sci-fi fans who love mechs and war!